In his seminal book The Omnivore’s Dilemma, Michael Pollan makes the important point that because ours is a country without a common, deeply held culinary tradition, we are uniquely susceptible to the vagaries of food fads. The same could be said for our drinking habits--without an engrained and broadly embraced understanding of alcohol’s role at the table and beyond, we’ve left ourselves open to a whole host of ridiculous drink crazes. How else to explain abominations like appletinis, Jagerbombs, Red-Bull-as-a-mixer, and the like? But just as wine has gained not only a wider audience but also a far more passionate and well-informed one over the past several decades, spirits are now finding themselves the subject of increasing (and overdue) attention, study, and appreciation. Serious bartenders, mixologists as venerated as chefs in some cities, and--yes--mammoth spirit-producing corporations are getting into the act, and the result is both an abundance of exciting new products as well as a slowly spreading sense of confusion: What, you might wonder as you ponder the profusion of unfamiliar bottles lined up along the back bar, is Chartreuse, or reposado tequila, or Averna? 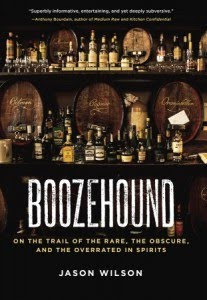 Thankfully, Washington Post spirits columnist Jason Wilson has recently published a book, Boozehound (Ten Speed Press, $22.99), that not only clarifies these tipsy mysteries, but does so in a way that is entertaining, thoroughly engaging, and utterly informative. Wilson is the guy you’ve always prayed sits next to you at the bar. He is funny, charming, and wildly well-informed. His work has taken him around the world in an effort to discover the truth behind the spirits and cocktails that the newly minted American drinks cognoscenti gravitate toward today (or soon will be; Wilson seems to be as much a prognosticator as a writer), and that, sadly, have been lost for too long in a sea of synthetic flavorings and mixers. Remarkably, however, his travels and knowledge have resulted not in a tone of pedantry and condescension but, rather, one of contagious enthusiasm. Wilson, however, has a keen enough eye and a smart enough voice that nothing is ever dull, or even as expected. He writes, for example, on the preponderance of processed and generally inauthentic mixers, that they “usually [sneak] up on you, like a mullet seen from the front. And you usually spot it too late, once you’ve settled onto the bar stool.” He then goes on to mine a cocktail’s history, its significance, and the ways in which serious drinkers everywhere can reclaim it--recipes included. In the end, Boozehound is not just a book for drinkers. Rather, it’s an invaluable volume for curious people everywhere, and its insights into culture, history, travel, and, yes, spirits, are rewarding on any number of levels. They’ll also make you seriously thirsty for a cocktail--with a renewed sense of appreciation for what went into it, of course.